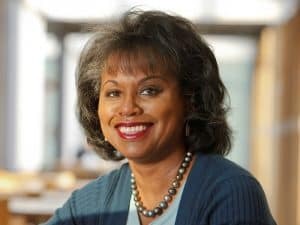 At the 2019 PEN America Literary Gala, PEN America will honor professor, lawyer, and equal rights advocate Anita Hill with the PEN Courage Award. The youngest of 13 children from a farm in Oklahoma, Hill received her J.D. from Yale Law School in 1980. She began her career in private practice in Washington, D.C. There she also worked at the U. S. Education Department and Equal Employment Opportunity Commission. In 1989, Hill became the first African American to be tenured at the University of Oklahoma, College of Law, where she taught contracts and commercial law. Currently, at Brandeis University, she teaches courses on gender, race, social policy, and legal history. Along with Provost Steve A. N. Goldstein, in 2015, Hill was responsible for implementing Fulfilling the Promise: The Brandeis University Strategic Plan. As counsel to Cohen Milstein, she advises on class action workplace discrimination cases. In December of 2017, Professor Hill became the Chair of the Hollywood entertainment industry’s Commission to Eliminate Sexual Harassment and Advance Equality in the Workplace. In that role she will establish a best practices and policies framework for addressing workplace abuses and discrimination and creating more equitable work environments throughout the industry. Hill’s latest book is Reimagining Equality: Stories of Gender, Race and Finding Home (Beacon Press, 2011), an analysis of the housing market collapse of 2008 and its impact on gender and racial equality. Hill adds this work to numerous other publications including books and articles on subjects ranging from bankruptcy to equal educational opportunity. Professor Hill continues to push the envelope in pursuit of equality, teaming up with MacArthur Genius Award-winning artist Mark Bradford as he created an exhibit for the 2017 Venice Biennale International Arts Festival opening in May in Venice, Italy. In addition, Hill is engaging prominent academics and business professionals all over the country to spearhead “The Gender/Race Imperative,” a project to revive awareness of the broad capacity of Title IX, the crucial law mandating equal education opportunities for women. “The Gender/Race Imperative” will kick start inquiry as well as legal and policy reforms that empower girls and women of all races and economic backgrounds for success in schools and workplaces. During the academic year, 2017-2018, Professor Hill served as a Martin Luther King, Jr. Fellow at MIT in the lab of information theorist and electrical engineer Professor Muriel Medard. There she and Professor Medard hosted a series on gender and race equity in education with a focus on science and engineering. Hill is a contributor to the National Academies of Sciences, Engineering and Medicine’s June 2018 Consensus Study Report, SEXUAL HARASSMENT OF WOMEN: Climate, Culture, and Consequences in Academic Sciences, Engineering, and Medicine. Time, Inc., Newsweek, The New York Times, The Boston Globe, and Ms. Magazine have published Professor Hill’s commentary, and she has made numerous appearances on national television programs. She is the recipient of numerous awards, grants, and honorary degrees. Hill’s professional and civic contributions include chairing the Human Rights Law Committee of the International Bar Association, and membership on the Board of Directors of the National Women’s Law Center and the Boston Area Lawyers Committee for Civil Rights. Professor Hill is the subject of Freida Lee Mock’s documentary, Anita, which premiered in January of 2013 at the Sundance Film festival. Samuel Goldwyn Company staged the film’s theatrical release in the spring of 2014.